Well, after looking for over a year and a half for an Auto Art DHG Bullitt model and being unsuccessful, ended up getting one new in the box for Christmas. I guess my question is was i looking in the wrong places for over a year? All I could find from AA was the 2001 bullitt in black. How hard would it be to find a replacement in DHG should something happen to mine if I decide to display it? the DHG is no longer in production and sold out, so you are at risk of obtaining one from whatever happens to come up in the used market. The black is also no longer in production, but you can still find unsold stock. They refused to make one in True Blue. 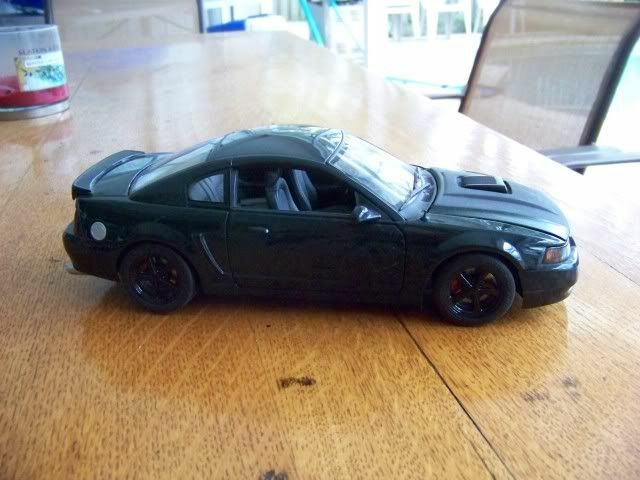 But interestingly enough, you can get a 2004 red Bullitt....so just get that and paint it what ever color you want! Hmmm, ok guess I will keep mine in the box with all the stickers on it! I always thought it was weird that they refused to produce a TB, but then went ahead and did a production run on the ultra rare 2004 red Bullitt! Even better is when they were contacted about their gaffe, they arrogantly held to their stance that they produce nothing but high quality and that there was nothing wrong with the 2004 version. But hey...get yours now while you still can...you too can own the rarest of the rare! I followed one on eBay recently, but forgot to go back and bid. Very difficult to find one. Mine was recently damaged and the roof is caved in. =( Wondering if my "dent guy" could work his magic on it. Yeah, your dent guy can work that out. rancorkeeper and waycad like this. 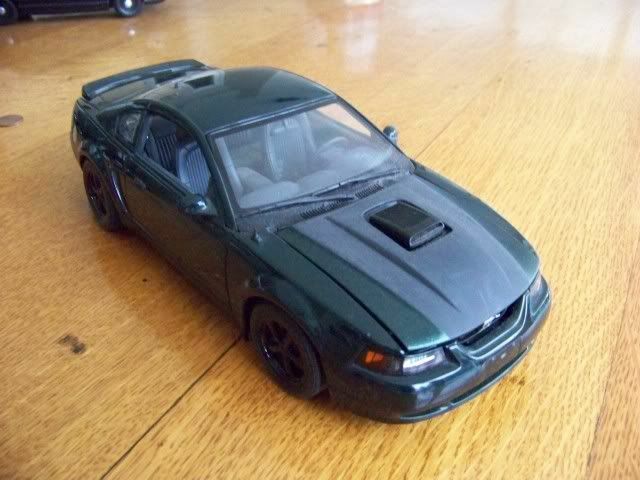 Couldn't afford to buy an '01 Bullitt when it launched, so I bought an Auto Art 2001 DHG Bullitt die-cast back in the day to put on my office shelf. Glanced at it all the time. Now, 13 years later, the real deal is parked in my garage. Proof that the "carrot at the end of the stick" theory really works. instead of putting in the engine bay, stick on top of your dash under the mirror. no one can get to it when you lock the car and they can still see it well. where I always stuck mine when I had the B and now, stick mine for the Snake. 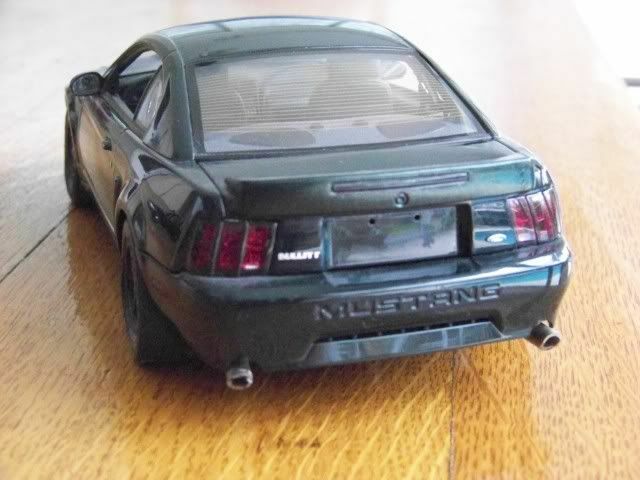 I still have my rarest of all DHG Autoart's B....the Frankenstang. Once in a while, I'll just type in "2001 Bullitt" on Ebay to see what comes up. It seems there was always a few DHG AA Bullitts. I guess I haven't looked in a bit. I have one I got back about 12 years ago for displays and recently bought one from a friend. I left that one in the box, but my display Bullitt lost a windshield wiper and the rear axle broke. I fixed the axle and got a windshield wiper off of a Maisto 99 Mustang I found at the flea market for 3 bucks. It's got a few scuffs that don't want to come out, but I really don't display it with the car anymore. Dakota - ya do what ya gotta do! I don't think I've seen another done in blue. Tim - I'm assuming you now have a Cobra and a Mach 1 that have Bullitt parts on them? Did the replacement trunk and hood fit okay? A few years back I stumbled upon a DHG one which I ended up giving to someone else for what I paid for it. I regret doing that now, should've kept it.